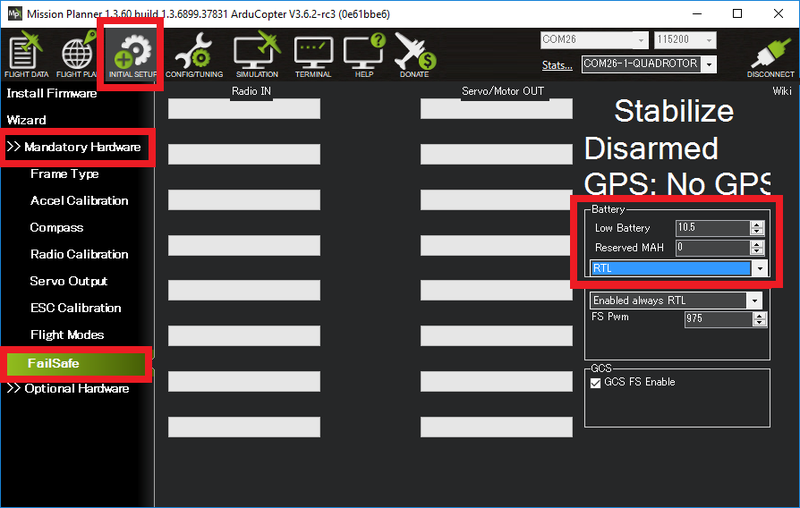 The battery failsafe can be configured to automatically switch the vehicle into RTL, SmartRTL or Land mode if the vehicle battery voltage drops below a specified voltage for 10 seconds or the estimated remaining capacity has dropped below a configurable threshold. This failsafe requires the vehicle have a working Power Module. voltage drops below the voltage held in the BATT_LOW_VOLT or FS_BATT_VOLTAGE parameter for more than 10 seconds. The default voltage is 10.5 volts. If set to zero the voltage based trigger will be disabled. Even if the failsafe action is set to “None” (i.e. BATT_FS_LOW_ACT = 0) the buzzer will buzz and the LEDs will flash yellow. To completely disable the battery failsafe set BATT_LOW_VOLT and BATT_LOW_MAH to zero. Once the battery failsafe has triggered, it cannot be reset until the flight controller is rebooted. Set the “Reserved MAH” or leave as “0” if the failsafe should never trigger based on estimated current consumed. Copter-3.6 (and higher) includes a two-layer battery failsafe. This allows setting up a follow-up action if the battery voltage or remaining capacity falls below an even lower threshold. BATT_CRT_VOLT - holds the secondary (lower) voltage threshold. Set to zero to disable. BATT_CRT_MAH - holds the secondary (lower) capacity threshold. Set to zero to disable.